Customs officers from Guangdong province and Hong Kong have seized 2,070 kilograms of ivory and 8,268 kg of pangolin scales after cracking a major smuggling operation in mid January. "It is the largest smuggling case involving pangolin scales that Hong Kong Customs and Excise Department has cracked so far," Wong Lai-yung, divisional commander of Special Investigation Division 1 with Syndicate Crimes Investigation Bureau of Hong Kong Customs and Excise Department, told a news conference in Guangzhou, Guangdong province, on Friday. The operation was launched after receiving accurate information from Guangdong customs, Wong said. Zhan Li, director of the Anti-Smuggling Bureau of Guangdong Customs, said the crackdown on the major smuggling case demonstrates the determination and abilities of customs officers from the mainland and Hong Kong in the fight against smuggling cases involving endangered animals and their parts and products. According to Wong, the ivory and pangolin scales were estimated to be worth more than 50 million yuan ($7.46 million). "They were found in a container from Nigeria, Africa, but their final destination is still being investigated," Wong told China Daily on the sidelines of the news conference. Hong Kong customs officers have detained a man, 39, suspected of being the boss of a local trading company, and a 29-year-old female company staff member, according to Wong. But he refused to rule out more arrests, as the case is still being investigated. "Both detainees are Hong Kong residents who are now on bail pending trial," he said. The large amount of pangolin scales indicates that between 13,000 and 20,000 pangolins had been slaughtered, as a pangolin usually has from 0.4 to 0.6 kg of scales, insiders said. Hong Kong customs once seized more than 7 metric tons of smuggled pangolin scales in a special operation in 2017, Wong added. 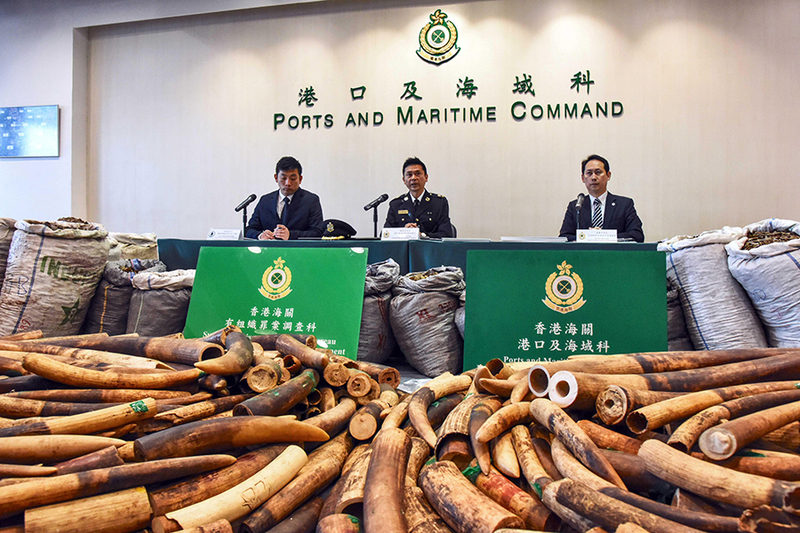 Zhan Li said Guangdong customs has expanded cooperation with counterparts from Malaysia, Vietnam, Kenya, Nigeria and Chinese Hong Kong in the fight against smuggling of endangered animals and their parts and products in recent years. Last year, Chinese authorities, in cooperation with police from Kenya and Nigeria, successfully extradited three ivory smuggling suspects from Africa. "The potential for big profits has encouraged criminals to smuggle ivory into the mainland after China officially banned commercial processing and sales of ivory beginning in 2018," Zhan said. "Guangdong customs will continue to spare no effort in advancing cooperation with their overseas counterparts in fighting any smuggling case in the months to come, despite the achievement.